How quickly sew a tunic? ~ DIY Tutorial Ideas! Home » Sewing , Tutorial » How quickly sew a tunic? - 1 yard 60” wide jersey knit or other knit fabric that does not fray. You can use 45" fabric, but your shirt will be pretty short. 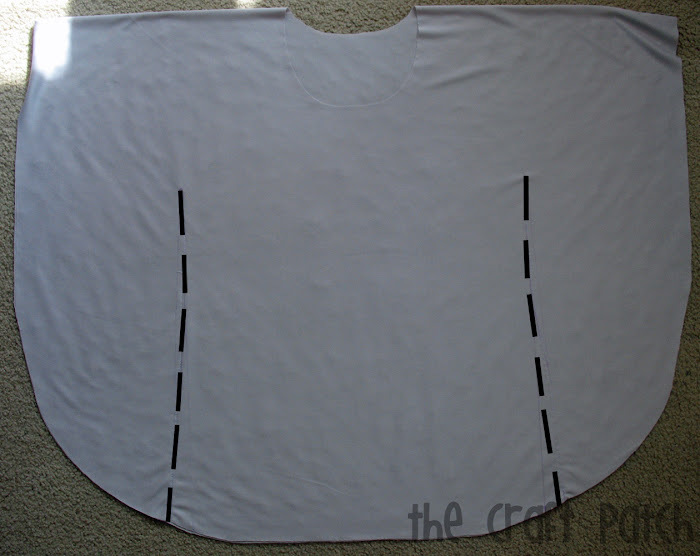 Step 1: Fold the fabric in half and square up the edges so that all the corners are 90 degree angles. Step 2: Round off the two bottom edges. An easy trick to make sure both sides are even: round one side, then move the scrap you just cut off over to the other side to use as your guide. Step 3: Cut a neck hole. I used a favorite tank as a guide. I cut through both thicknesses along the back edge, then moved the tank out of the way to cut the front part through only the top layer of fabric. You can get creative here and cut any shape neck you want…a boat neck would be cute or something big and gaping. Whatever floats your boat. haha. Step 4: Sew two lines up the sides to fit around your middle. My fabric is not super stretchy, so I left it pretty loose. I also didn’t sew perfectly straight because my mid-section is not straight. I curved the line to fit the curves of my body. You are done! I told you it was easy…as long as you use no-fray knit fabric.